Today I want to write about a reptile that has a scary name and looks scary, but really isn’t scary at all, the thorny devil. These wonderful little lizards grow to up to 20 cm (8 inches) long. Their thorns may look scary, but they are useful too. They are set up in a way that channels water to their mouth if it lands on their back, meaning that they can drink overnight dew and rain which is very helpful when you live in a desert. Thorny devils are specialist ant eaters. They will sit by an ant trail and use their sticky tongue to eat up to 5,000 ants per day. Baby devils can eat ants from the moment they are born. They can change colour according to the time of day, weather or if they are alarmed. Their colour ranges from yellow, red, olive green and brown. 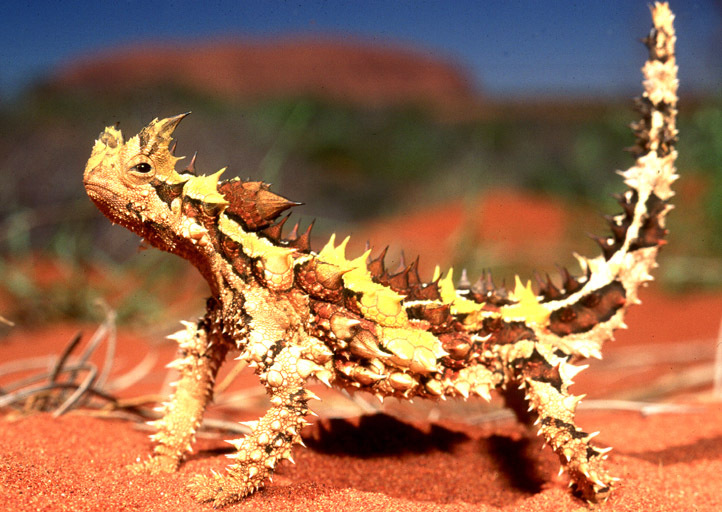 Thorny devils are a fairly common animal, found in dry scrubland and deserts throughout western and northern Australia. Are there any other interesting facts that you would like to share about thorny devils? They have a false head on their shoulders, so when they tuck their real head between their legs, the fake head takes its place.